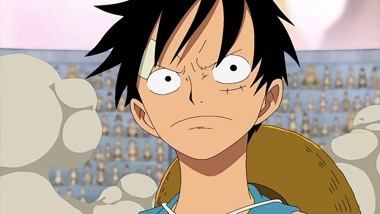 Since the series began over ten years ago One Piece has become a behemoth that has not waned in popularity just yet. A memorable series is epic and pretty darn long. In 2010 in Japan, the manga series had toppled Harry Potter in terms of book sales. It is currently the highest selling manga in Japan's manga history. There are over 60+ volumes out now that is still ongoing. 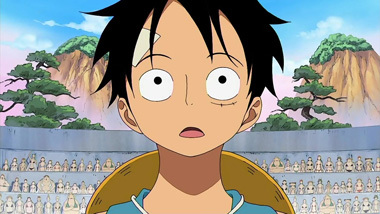 The anime series has broken over 500 episodes, and with over ten movies, it has made the mangaka Eiichiro Oda, a highly successful and well known creator. 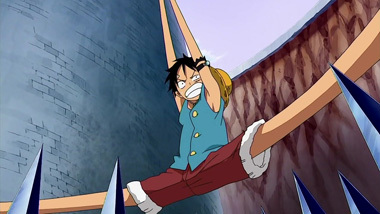 One Piece is definitely not Oda's first work, though in the few other works he has created outside of One Piece, there is a recurring theme of individuals with dubious backgrounds of honor. If you know of his other works from Shonen Jump, then you may pick up in One Piece that Oda does reuse certain characters or devices from his previous works. From his first work of Wanted in 1992, he won second place in the 44th Annual Tezuka Awards. This is a coveted Japanese manga publisher's award to new manga artists with the best story manga. Story manga is a manga technique on delivering story through a method of flowing through the panels in a linear fashion. 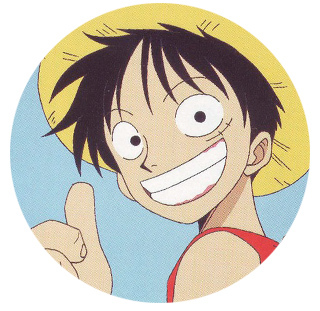 After gaining the award, Oda was employed by Shonen Jump, where he was an assistant to other mangaka for a period. Though Oda himself cites Akira Toriyama as his favorite artist, one of the artists he assisted is Nobuhiro Watsuki, who American audiences should know is the creator of Rurouni Kenshin. 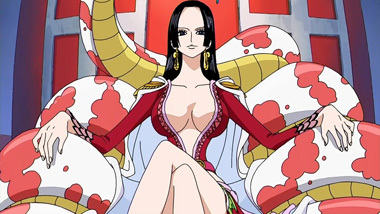 Watsuki had credited Oda with character creation of Honjo Kamatari. 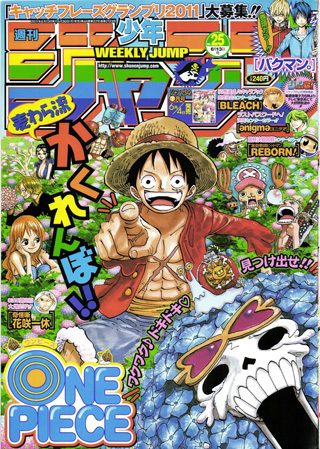 It was a treat for fans that Oda had worked with Toriyama on a special crossover one shot for Dragon Ball x One Piece. 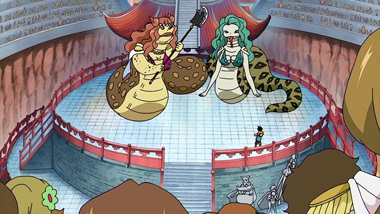 One Piece began as a third alternate retelling of Oda's Romance Dawn manga one shots. 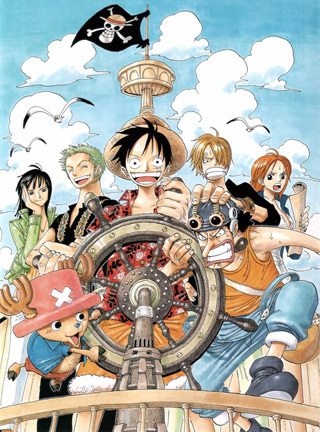 As the series One Piece began in 1997, the art was at the time something that quickly became a secondary device, as readers are inevitably drawn into the story of Monkey D. Luffy a man with a dream to become the Pirate King. Oda creates a plot rich world where there are characters with compelling back stories. 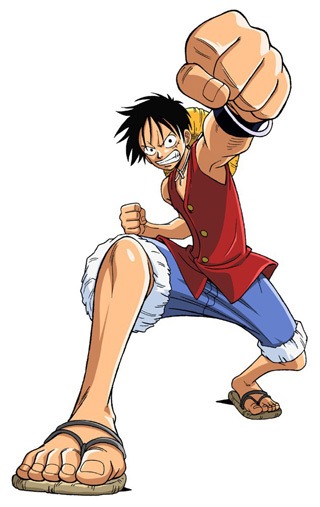 Japan industry has also Japan has linked and promoted One Piece in other industries, that propelled the reputation and popularity of One Piece. 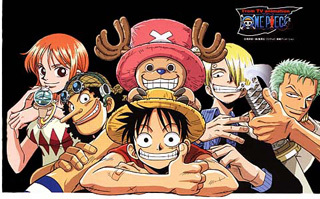 Similar to other shonen stories, One Piece has built around the idea that with perseverance and with the support of friends, any dreams can be a reality. Can you imagine the variety of products that came out with this series? There are life size replicate ship models, themed restaurants, life style goods, electronic goods, hygiene products, toys, figures, plushies, video games, compact discs, automobile parts, fashion and accessories. Anything you can stick a logo with, then there may have possibly been a product. 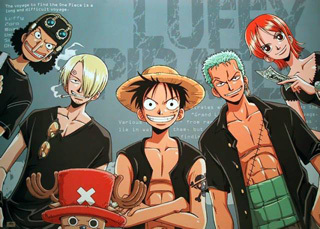 One Piece while not a brand, is an image that sells, so there are many products that remind people of the series. 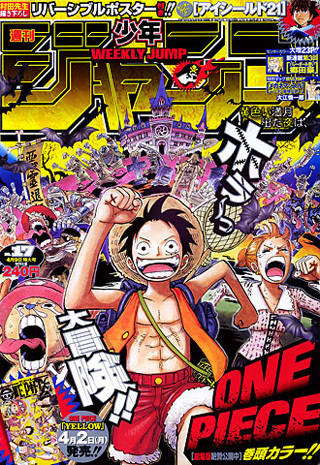 Luffy actually was the first animated character to ever be featured on the cover of Men's Non-no, a notable Japanese fashion magazine. Chopper also had a specific line of product goods for just how cute he is. Paired with the timeless theme of cherry blossoms, I happen to own a purse accessory and an ipod skin to just glorify how cute he is. Nami, Robin, and Boa Hancock are featured on mouse pads. There are also fan goods that are not official merchandise, but on Cafe Press in 2011 if you do a search for Sanji and aprons, those are purchasable goods. 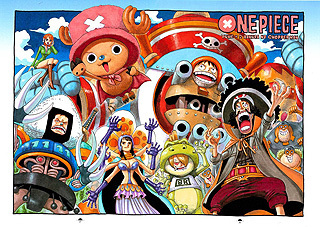 Every season there may or may not be new goods that are introduced in a limited numbers, so beyond the failure of America in capitalizing on these goods, One Piece products is quite popular in Japan and the rest of Asia. As I mentioned earlier that there is a larger amount of anime episodes than there are manga, so the source material is the manga. What differences can the manga and anime have? 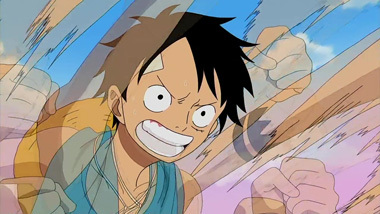 The manga is set in arcs with a specific enemy that the Strawhats face; so the anime would create more action that would flesh out what is not on paper. 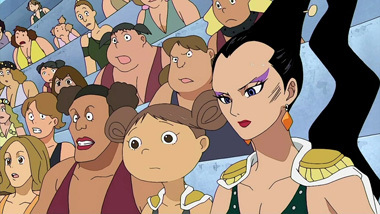 In the anime, with a set schedule, often animators complete what was already written in the manga. When that happens, there are anime only arcs that never appear in the manga. One Piece had stayed quite accurate to the manga, and so knowing the anime only characters, it doesn't break into the pacing of the manga. Enemies that are fought in the anime are rarely revisited; however in the manga this may be opposite. Characters are revisited in snippets of manga chapter covers. Since the manga is released on a weekly schedule, while the main plot focuses on Strawhat Pirates on another adventure, the manga chapter cover provide a snippet of what happens to characters like the Baroque Works Agents, Alabasta citizens, Skypiea villain and citizens. 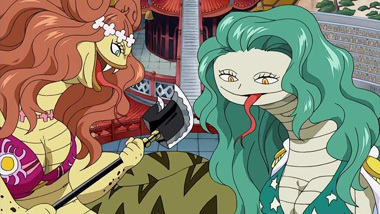 Oda is quite connected to the anime as a creator, so for example in the tenth movie, the villian was specifically created by Oda and used. That added flavor to the One Piece's growing history. There may be many years before this series is concluded in Japan. Across the pond, in the United States, with popularity and support then it is not foreseen that the products would end in release. The anime in the United States is licensed by Funimation, and a strategy to ward off illegal distribution was to stream the anime with English subtitles alongside the Japanese air-time. On the manga front, to also protect against illegal distribution, Viz caught up with the Japanese publication releases. So in the argument of ninja vs. pirates what would your answer be? 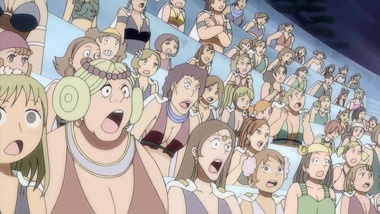 Below: Scenes from an epsiode of One Piece. Below: Promotional illustrations for One Piece.